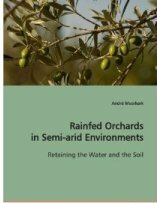 The spatial distribution and properties of rainfed orchards in semi-arid environments result from complex interactions between man and the physical and economical environment. It is shown how the practice of clean sweeping (i.e. frequent shallow tillage) influences the orchard water balance and how the removal of traditional soil and water conservation structures affects the connectivity of overland flow to the river system. Clean sweeping constrains the root growth in the plough layer, so that the trees cannot access the water from small rain events. It appears that the practice of clean sweeping limits the water availability in orchards on loamy soils with an annual rainfall in the order of 300 mm. The observed decline in conservation structures like terraces and check-dams leads to an increase in the connectivity of water and sediment to the river system. An alternative for these traditional techniques to retain the water and the soil is the application of cover crops. Field evidence and water balance simulations suggest that cover crops are feasible in areas with an annual precipitation of 500 mm or more.